Few would disagree that keeping up with mobile technology poses an ongoing challenge for the hotel industry. In one move to stay ahead of the curve, Starwood Hotels & Resorts recently unveiled its new Starwood Preferred Guest (SPG) app for Google Glass. Users can explore destinations, book stays, and check point balances, among other features. Recognizing that the wearable technology market is rapidly growing into a multi-billion dollar industry, Starwood wanted to get in at the ground floor and start learning on this new platform, says Chris Holdren, senior vice president of SPG and digital. The goal is to explore new technologies and learn from guests’ interactions with them. Developed by an in-house team, this is the only Google Glass app presently available that enables booking a stay at any of Starwood’s hotels around the world. Designers feel the personalized interface is ideal for any Glass Explorer, providing ready access to account information along with features such as voice command search and geo location, search and book options, and photos of a selected hotel’s amenities. While the number of potential users may be relatively small, company officials expect interest to grow. 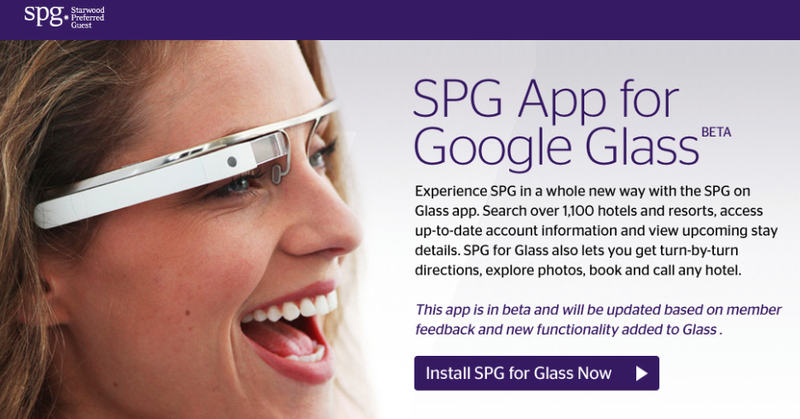 In the meanwhile, the SPG app for Google Glass will complement other digital offerings from apps to messaging to mobile web. In researching prospects for the initiative, Starwood execs noted that mobile technology is already having a huge effect on business, with mobile bookings growing five times faster than web bookings did 10 years ago. In fact, analysis of trends in use of mobile technologies was a key factor in the decision go with the new app. He notes that smartphones and tablets now capture nearly 1 in 5 online travel dollars, with more than 53 percent of travel inspiration now beginning on a mobile platform. He also notes that in 2013, 40 percent of all industry-wide travel searches were done via a mobile device, up from 25 percent in 2012. After a hotel is chosen, the app offers directions, a few photos and the opportunity to book a room either by phone or email. Starwood also promises SPG members that its app will recognize their upcoming stays and push relevant information about the stay 48 hours before arrival. 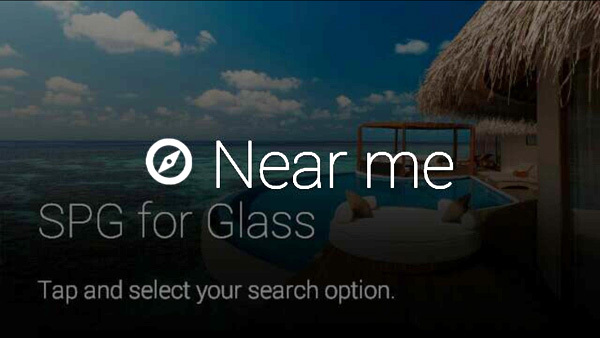 Other travel-inspired Google Glass innovations that have popped up recently include Hotel Near Me, a hotel reservation app for Google Glass launched by Destinia, an online travel agency; a Google Glass-assisted hotel check-in solution that’s being developed by hospitality industry software solution provider, Itesso; and TripIt’s Glass app, which enables users to view their flight details and car rental, hotel, and other travel reservations. While unable to predict whether other major hotel companies will follow suit, Holdren says Starwood is accelerating its efforts in digital innovation. The company’s other recent moves include keyless mobile check-in and introduction of a Chinese Android app. He notes that as mobile browsing and booking continue to play a larger role in the travel experience, digital innovation will be increasingly important in offering guests the best, easiest-to-use tools on the latest platforms. backlash against Hollywood, US cultural dominance and capitalism. It saves a great deal time through not packing items that are not allowed for travel.